Ebros Kitchen Decor German Shepherd Dog Wine Bottle Holder Figurine Canine Unit Wine Rack Statue Ideal For Police Officers Dog Lovers Pet Awards by Ebros Gift at Verve Wine Bar. MPN: B00IJN9WN6. Hurry! Limited time offer. Offer valid only while supplies last. 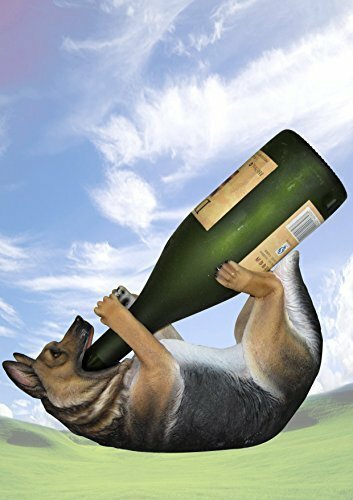 This German Shepherd Wine Holder Measures approximately HEIGHT 6.5" LENGTH 11.5" WIDTH 4.5"
Your party guests will love this adorable German Shepherd wine bottle holder. Beautifully handcrafted from polyresin, this incredibly detailed pooch makes the perfect addition to any canine or pet themed décor. Makes a great gift idea for law enforcement officers, fans of German Shepherds and even dog lovers. Aupa 6 Bottle Wooden Honeycomb Wine Rack - Free Standing Stackable Design for Kitchen or Countertop.